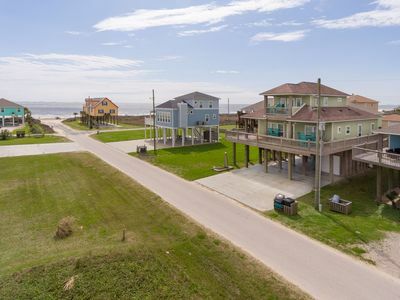 Conveniently just a short distance south of Houston and bordered by the shimmering Gulf of Mexico, you'll never be far away from the water at any time during your stay on Galveston Island, making this the perfect destination for your next beach getaway! 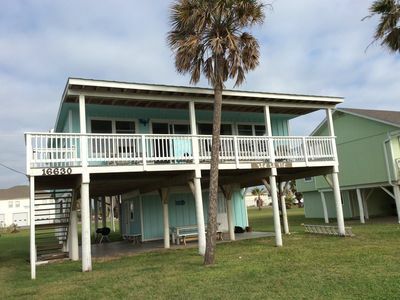 This vacation rental house with 3-bedrooms and 2.5-bathrooms has enough room to comfortably accommodate up to 9 guests over 2,100 sq. 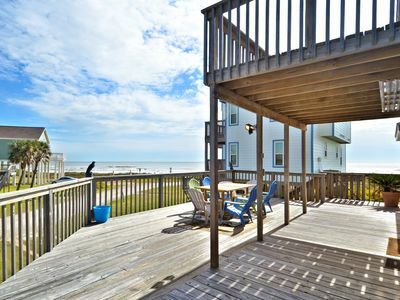 ft. of tastefully decorated living space, and will serve as a delightful home base for your trip to the beach! 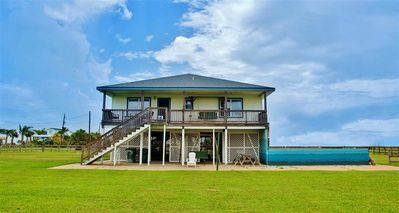 Located at the intersection of one of the island's main drags on a generously sized 1.5-acre lot, this home is literally right across the road from the Gulf of Mexico! 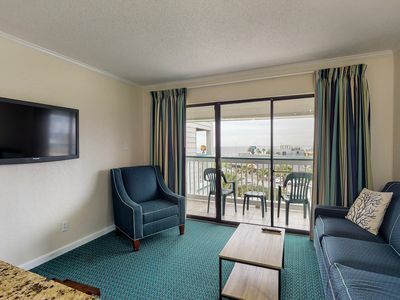 You and your travel companions will immediately fall in love with the home's great open floor plan, boasting bright colors, modern appointments, and an abundance of natural light through the several large windows, creating a soothing and aesthetically pleasing environment for your beach vacation. During your downtime, unwind in the beautifully appointed living room and enjoy your favorite show on the cable TV. When you're not out enjoying one of the area's fine local restaurants, prepare your favorite meal in the fully equipped kitchen, which comes complete with purple countertops and all the necessary cooking appliances. 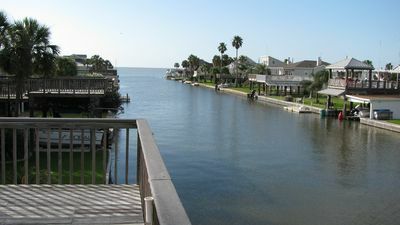 Furnished decks off of either side of the house provide spectacular views. 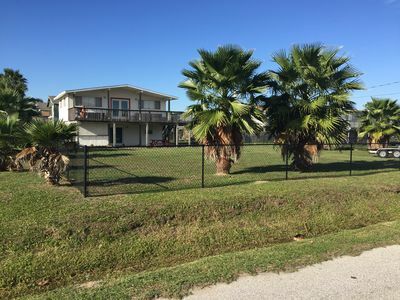 An open-air area below the house is great for family reunions and other events, and the large yard is ideal for volleyball or other fun outdoor activities. 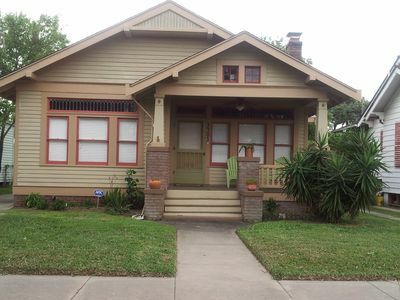 For your convenience, this home also includes a charcoal grill, wireless internet access, and laundry facilities. 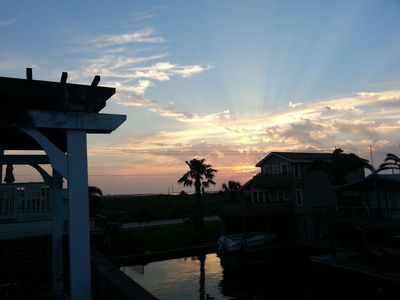 From this house, the best of Galveston is practically right at your fingertips! Enjoy the island's white sand beaches during the day as the gentle waves of the Gulf crash onto the shore. 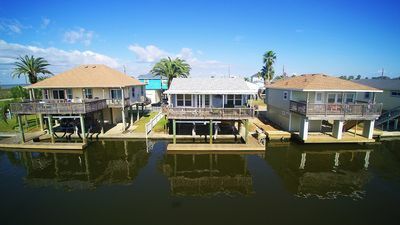 You'll find delicious restaurants and unique shops lining Galveston's streets, and other popular activities around the water include fishing, wind surfing, and boating. Charter captains in the area who know all of the good fishing spots can take you deep-sea fishing to ensure that you bring home the best catch. 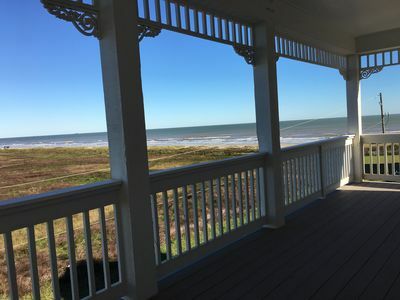 Whether you're traveling to Galveston to enjoy the beach or to simply unplug and unwind, this fabulous Galveston vacation rental house will quickly become a place you love coming home to at the end of the day! 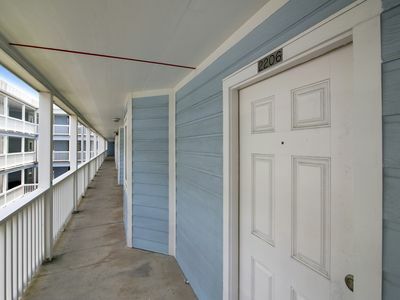 - Prime location, across the street from the beach! 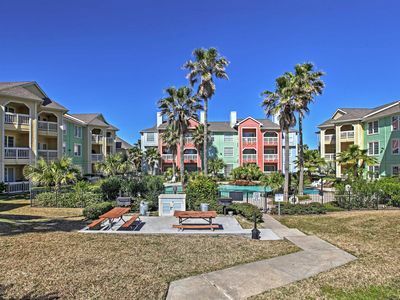 2BR Galveston Condo w/Community Pool! 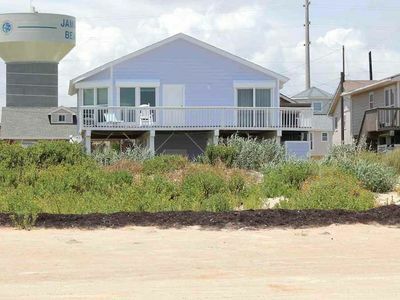 Amazing and Beautiful Beachfront Home that steps from the sand & water! Surf's Up! 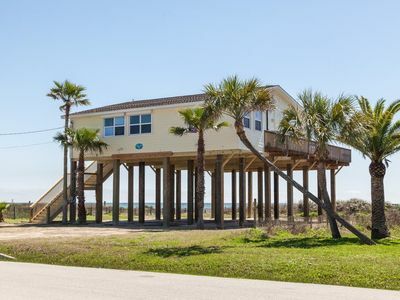 Just steps to the edge of the water! 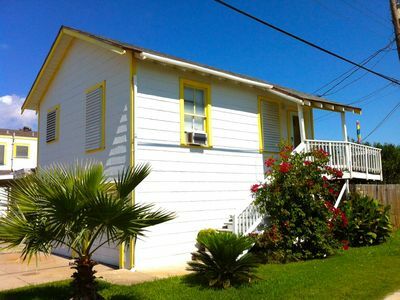 Hurry and rent this beach view home on beautiful Galveston Island, ask about of FREE ACTIVITIES with a reservation! 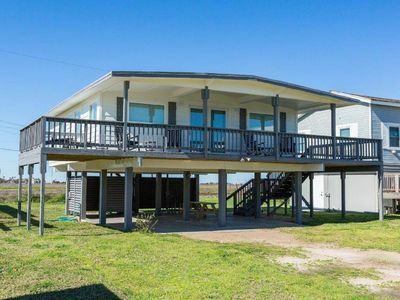 Nice Family Get Away On The Quiet Side Of Galveston. 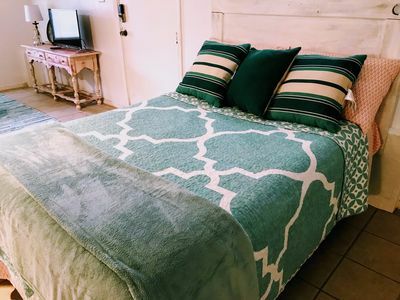 Seaclusion - only one block to the beach - 2 bedrooms/1 bath sleeps 6! 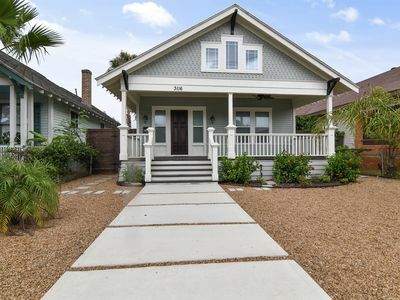 Best porch in the neighborhood! 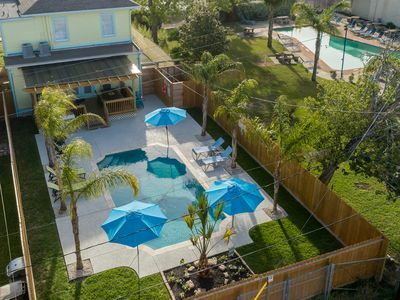 SWIMMING POOL, GAS GRILL, LARGE DECK, PARKING, AND PING PONG! 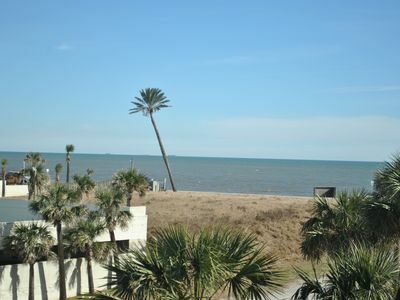 Gulf & Lake views, 2/2 with KING beds, Sleeps 8, Washer/dryer, PETS welcome! Frank's Oyster House - Just steps to the beach! Simple and Cozy WATERFRONT propety. Jamaica me Happy is perferct for and Island getaway! Ask about the $115 in freebies!